Definition: [BAHB-kah] Hailing from Poland, this rum-scented sweet yeast bread is studded with almonds (or walnuts), raisins and sometimes orange peel. This is a sweet bread and delicious both plain or spread with butter. The dough is easier to handle if mixed with a wooden spoon instead of using an electric mixer with a dough hook. Make this special "sweet" bread for breakfast or brunch on Mother's Day. 1). Mix flour, sugar, salt and yeast together. Blend in heated milk mixture; add eggs and then more flour as needed until dough can be easily handled. Knead for about 15 minutes. 2). Place dough in a large greased glass bowl and turn so top of dough is also greased. Cover and let rise in warm place until double in bulk. 3). Divide dough in half. Roll out each half into a rectangle shape. Sprinkle with cinnamon sugar, then scatter cherries, nuts and raisins over cinnamon sugar. 4). Roll up, seam side down, and place in 2 greased loaf pans (seam side down). Cover and let rise again. 5). Bake the babkas in a 325 degree F (160 C) oven for 25 to 30 minutes. (If they begin to brown too quickly, cover them loosely with aluminum foil). Note: When kneading, if dough is difficult to handle, grease hands! This seems like a very good recipe. Thanks for sharing it. thank you i can use this for my class..they will love it. i was assigned to bring in something sweet from my background which happens to be polish. Nor does it have cinnamon or any other such flavours. The taste is subtle and simple, which is what is so great about it. I am critical of adulterated recipes. 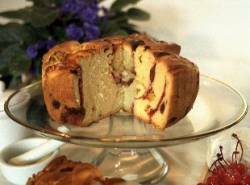 Traditional Polish Babkas do not have nuts or cherries or alcohol. They only have raisins or currants and are flavoured with grated lemon zest. They tend to be glazed with a mixture of confectioners sugar, lemon juice and water. This is just like the recipe my Babci used to make when I was a kid. She spoke mainly Polish and this is truly a polish babka recipe from the old country.